At the moment we can't think or find any hotels that promote themselves as being specifically gay owned in Leicester although given that it is now illegal to discriminate against gay couples or individuals wishing to stay in any hotel in the UK you shouldn't have any problem. Many of the major hotel chains now actively promote themselves to the gay market. If you're coming to visit the city for work or pleasure please one of the following booking sites listed below to find suitable accommodation in Leicester. We added links to booking.com and Laterooms enabling you to easily check availability and take advantage of any last minutes offers. 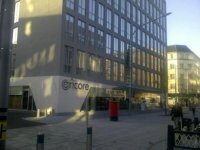 The Ramada Encore Leicester is a striking and contemporary hotel next to the new Curve Theatre, just a 5 minute walk from Leicester Rail Station and the city centre amenities. Easy access to road links, with East Midlands Airport 16 miles away. Free wifi is offered throughout the hotel. With spacious modern bedrooms, all with a walk-in shower, the rooms have a modern and clean feel with everything you need, whether you are visiting for business or leisure. On the ground floor is a stylish bar and bistro restaurant opening on to the pavement of Halford Street. Food and drink will be served all day ranging from paninis and sandwiches to pasta dishes and steaks. A modern and open area there will be two flat screen TV's and lounge to relax in. 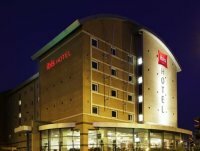 In the centre of Leicester, just 5 minutes walk from the train station and the very heart of the city, this modern hotel offers comfortable accommodation, free Wi-Fi, and good facilities at great-value rates. The Ibis Hotel Leicester is just a 5-minute walk from the citys main business centre and all of Leicesters great shops, restaurants and bars. The hotels convenient central location also means it offers good access to the regions major roads. The M6, M1 and M69 motorways are all within easy reach. There are 94 well-equipped modern rooms. Every room has all the modern comforts and facilities you need, whether you are exploring the area as a tourist or visiting on business. Each room has private shower facilities and a TV with pay-per-view TV and internet access. With a 24-hour reception, the ibis is within a 20-minute walk of the Guildhall, Leicester Cathedral, the New Walk Museum and Art Gallery. The Jewry Wall and Abbey Pumping Station are also within 20 minutes' stroll of the property. The Space Centre is a 15-minute drive away. Dinner is available in the hotels informal restaurant and there is also a 24-hour snack service. 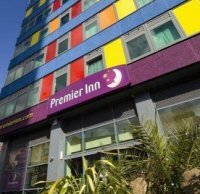 Within easy reach of the M1 and only 500 metres from Leicester Rail Station, this Premier Inn hotel has free parking, modern family-friendly rooms, a bar and a restaurant. The Premier Inn Leicester City Centre is just half a mile (800 metres) from the Highcross Shopping Centre. The restaurant at this Leicester Premier Inn offers a wide selection in a light, bright, modern setting. Not particularly attractive building but hotel and rooms are fine. Very close to Rainbow and Dove, Dover Castle and Bossa gay friendly bars. Having undergone a careful restoration, this beautiful Georgian Grade I Listed Building now boasts 4 luxurious Boutique hotel suites in the heart of Leicester City Centre. 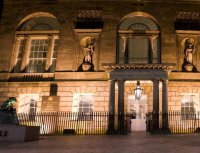 A place for celebration and business, The City Rooms can provide the setting, service and high standards expected of a venue that has stood the test of time; 'once a hotel that never was, now a hotel that is'. 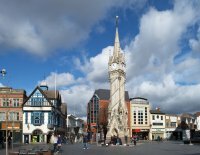 The hotels central position in Leicester means that all local amenities are within walking distance, including shops, bars and restaurants. 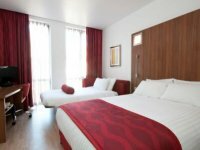 LateRooms.com - Hotel Reservations Service for Discount Hotels in UK. LateRooms, the Late Availability Specialist.